The O.C. Human Relations Commission encourages everyone to round-up some young (or young-at-heart!) 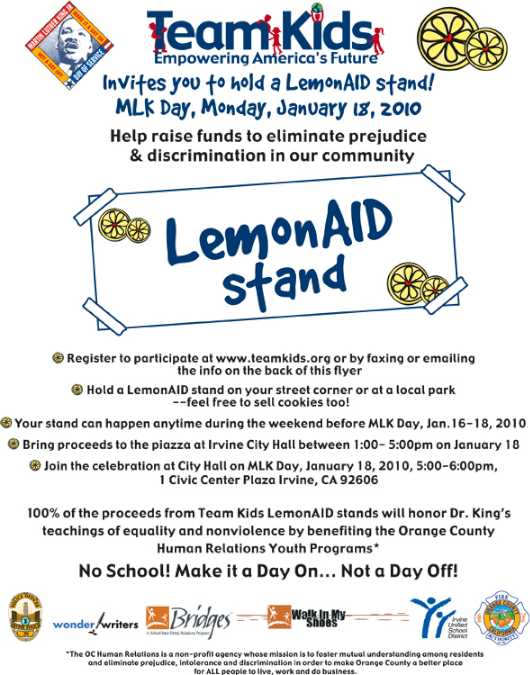 people and set up your own LemonAID Stand in service to honor the legacy of Dr. Martin Luther King Jr! Please note that completing the Disney’s “Give a Day” promotion is a multi-step process which is your responsibility. Team Kids can only verify your service if you complete that process more info here: and deliver your proceeds to Irvine City Hall as described above/below. 5. Bring all money raised to Irvine City Hall (1 Civic Center Plaza, Irvine, 92623) on Monday, January 18 from 1-5PM, to receive receipt and confirm attendance to approve Disney ticket validation. DON’T MISS THE OPPORTUNITY FOR YOUR CHILD TO BE CELEBRATED AND PRESENTED WITH A CERTIFICATE BY MAYOR SUKHEE KANG AND KEYNOTE SPEAKER DR. GAVIN HUNTLEY-FENNER AT THE CLOSING CEREMONY. THIS CEREMONY WILL BE YOUTH FOCUSED AND PROVIDE THE OPPORTUNITY FOR CHILDREN TO LEARN MORE ABOUT DR. KING’S LEGACY.